My first magic moment is being able to join in with one of my favourite linkys, it's been a while, I have been so busy and life and been as ever hectic with a few bumps along the way.....which meant finding the time and the emotional/physical energy has been a challenge....but I'm back and I'm ever so happy to be joining in. My second magic moment is I have been keeping up with my exercise, I really need to stay healthy and focused and have found this really helps....plus I'm not getting any younger and I really want the strength to continue to have fun with my kids and become fitter and stronger. And finally I'm ever so proud of my boys, they are growing into young little men and are achieving well, My youngest was star of the week which just made my heart glow when i saw his picture on the window at school, and my eldest is achieving one of the goals I always hoped he would, he is a confident swimmer and is moving through his groups with ease...I'm so delighted it really means a lot to me, As I craved for my children to be swimmers as I'm not, yet years ago I took swimming lessons just so I could help them learn, and my son has so far exceeded me. Proud moments. Well done for keeping up with your exercise!! Way to go!! Well done on the exercise. Hope you enjoy half term. My lovely I am over the moon to have you back and linked up and that things are getting on a even keel for you honey. Well done! It's such a brilliant thing to do and an excellent life skill to have. I am a rubbish swimmer and a bit skittish in water but I'm forever trying to get z into pools because I want him to learn properly. Such a proud Mummy moment for you having your son be star of the week. Well done keeping up with the exercise as well. Lovely #MagicMoments. 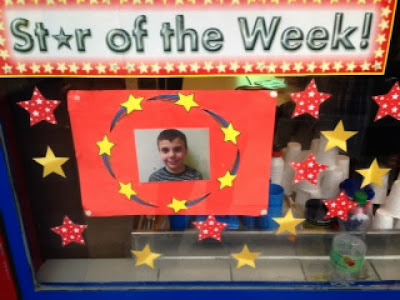 Oh well done on the exercise and the Star of the Week - seems some very magic moments indeed. Enjoy your half term - sounds as though you all deserve it! !